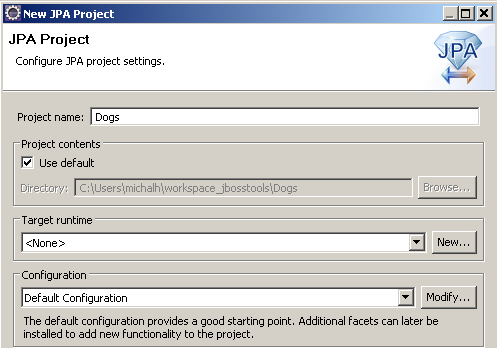 Did you see Part 1 of the series where I explained how to create an Eclipse JPA project? 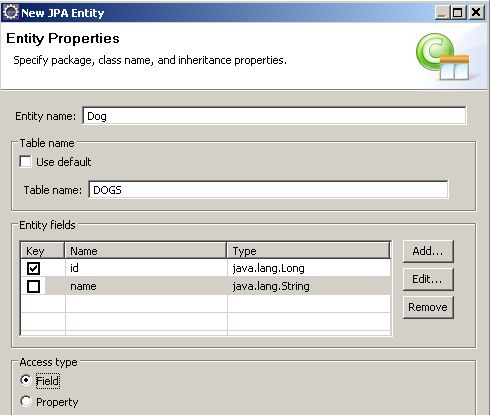 In this part of the series I will show some basic functionalities of Eclipse JPA as we create a very simple project. It is easy to create an entity class. Right click on a package, New -> Entity. Note: In our scenario we are not using a legacy database, so we will let Hibernate create all tables in the database for our entities. It's better to use the property one. Let's see the generated code. You have a no-argument constructor (that's a JPA requirement). You have an ID annotated with @Id, the class is annotated with @Entity and you have the @Table annotation so that an alternative table name can be specified. 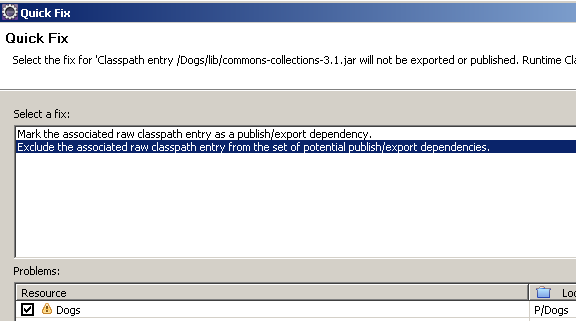 Note that in the peristence.xml file content was created automatically. It should look more or less like this. That's right, the table does not exist because we are not using a legacy database. We should let Hibernate create this table for us. We specified the ID column, but we did not specify how to get its value. Use the @GeneratedValue annotation. 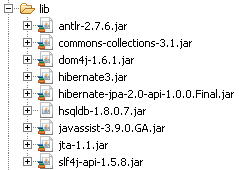 Compared to the project from the first part of the tutorial, you also need to add a dependency to slf4j-simple-1.5.8.jar. One more thing we must add is database specific stuff in persistence.xml. 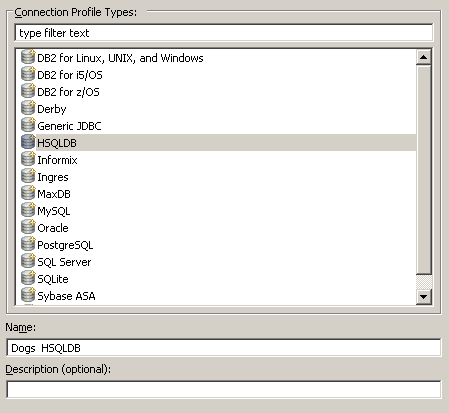 Eclipse knows how to connect to the database, but your project doesn't. The hibernate.hbm2ddl.auto paramater is set to create because it is more convenient for us in this situation. It means that the database is dropped and recreated on application start-up, but is not dropped after it shuts down, so that you can investigate the content of it after the application has run. Let's create simple DAO classes, namely a generic DAO and DogDAO. * Generic DAO for other DAOs to extend. This is a simple generic DAO. 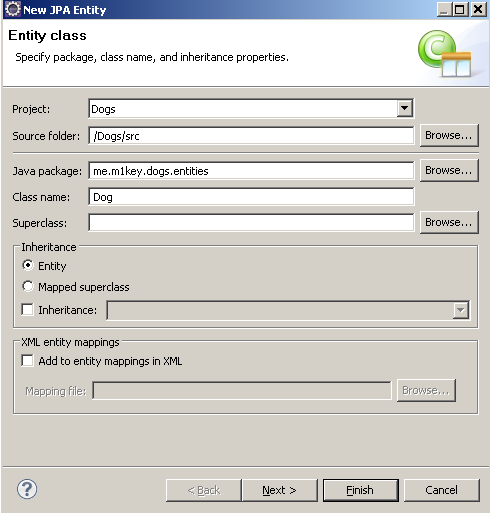 All it does is it allows for using its createEntityManager method from extending classes. This is temporary design, not a recommended way of doing it, mind you. 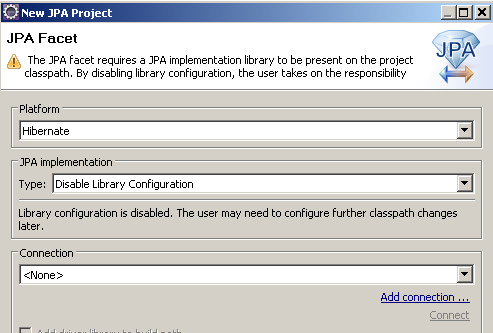 Now, look at the createEntityManagerFactory method - it specifies the persistence unit name. It is the very same name which is specified in our persistence.xml file. Let's create the DogDAO then. Two simple methods, one for saving dogs in the database, and one for retrieving all of them. Below, sample code that uses those DAO classes. * Launches the simple JPA demonstration application. It's very very basic at this point. But what happens if you run it? And, if you refresh/clean the project now, you should see that the previous error (Table "DOGS" cannot be resolved) is now gone. You may have to do more Eclipse magic, like closing the database connection and opening it again etc. 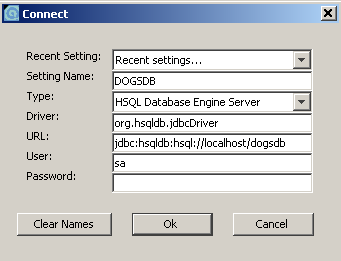 You can create entities from existing database tables, but it doesn't work so well, as I will show. 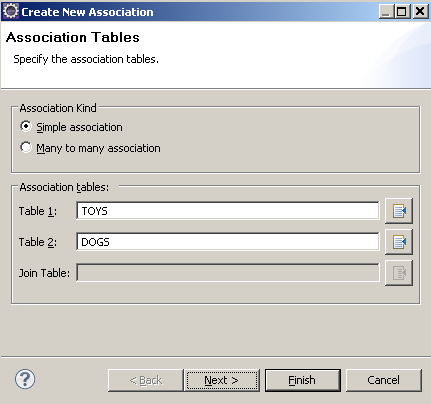 Imagine you already have an existing table in the database. Or, better, let's create one. That's simple SQL code (compatible with HSQLDB) creates a table called toys with a single column primary key and a toy name. 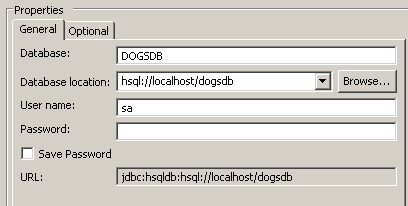 There's also a column DOG_ID which we are going to make a foreign key. That's the foreign key. 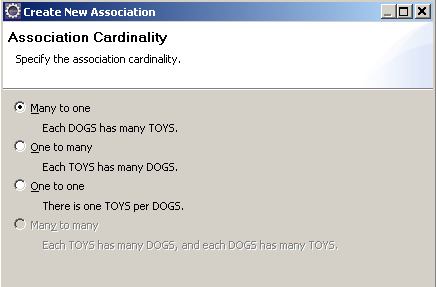 ON DELETE CASCADE means that if a dog is deleted - all its toys are deleted too. 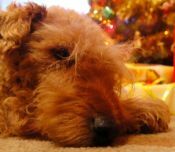 If a toy is deleted - the dog stays. Dogs don't share toys in our application. 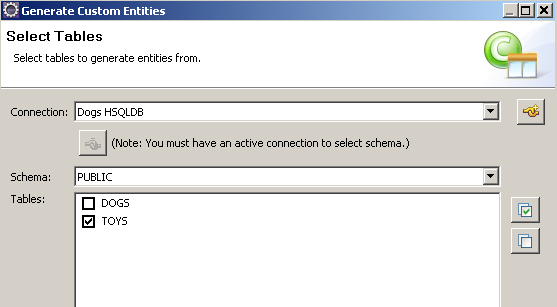 Simply refreshing your database connection in Eclipse may not work (didn't work for me), so you may have to close it and open it again. Now it's time to specify the kind of association. In our case, each dog has many toys. If you now click Finish, there's a surprise waiting for you. The list of associations remains empty. ... and let it create the table in the database, and then from this Hibernate-made table I repeated the procedure - I got the same disappointing result. What am I missing here? 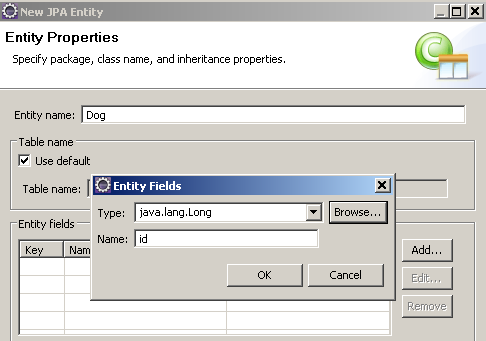 I gave up generating entities using Eclipse JPA, I wrote them myself. Look at the previous code sample. This gives a one way association from a toy to a dog. A dog entity is unaware of its toys. You would need a separate DAO (ToysDAO) to even save toys. CascadeType.ALL (javax.persistence.CascadeType) does the trick. 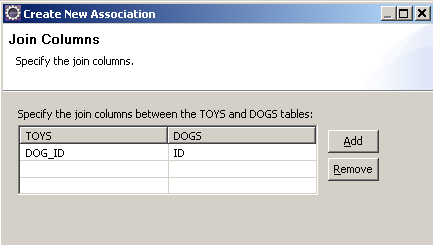 Join table "DOGS_TOYS" cannot be resolved. Sometimes you want to map a collection of plain Objects and not entities. In our case, a dog can have some nicknames. But not anymore, now you can use @ElementCollection like shown above. The second album with pictures from Porto is different; there are no sights - instead you can see lifesavers in action near Castelo do Queijo.